Almost on the eve of his 77th birthday, King Bhumibol Adulyadej, observing the violence in three of Thailand’s southern provinces - Yala, Pattani and Narathiwat - warned that the country “might fall into ruin” unless the army and police can end violence in the Muslim-majority south, where officials blame a separatist insurgency for more than 540 deaths this year. The King who usually only intervenes during acute national crises, urged soldiers and police officers to cooperate to deal with the region’s turmoil. Muslim leaders in Thailand’s southern provinces have complained that rifts between the military and police, along with their hard-line tactics, have made the situation worse. Following an uproar over the recent killings, many dying after being crammed into trucks and suffocating, the King told the government to take the “gentle approach” to curbing the violence. 17 November 2003 His Majesty the King grants an audience at Piamsuk Villa of Klai Kangwol Palace, Prachuap Khiri Khan Province, to Her Royal Highness Princess Maha Chakri Sirindhorn and members of the International Award Committee of the Prince Mahidol Award Foundation, on the occasion of their visit to Thailand in order to attend the Prince Mahidol Award Foundation Committee Meeting for the year 2003. “But if the military and police strongly, seriously cooperate in handling the situation, peace would be restored. If not, the nation might fall into ruin, meaning the people will live without peace and happiness, the people will have no security,” He cautioned. For her part, HM the Queen was appalled at the “needless killing of ordinary people, by elements she did not know”, even after regular visits to these areas for more than 30 years. 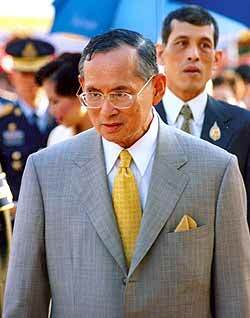 Born on Monday, the fifth of December 1927 at the Mount Auburn Hospital in Cambridge, Massachusetts, King Bhumibol Adulyadej was the third - and youngest - child of their Royal Highnesses, Prince and Princess Mahidol of Songkhla. His birth certificate registered the future King as, simply, “Baby Songkhla”. There is now a square in Cambridge named after King Bhumibol, dedicated in honour of the royal birth. As yellow is the Thai colour for Monday, it is little wonder then that “Monday’s Child” adopted yellow as the official colour for the Royal Household insignia. His Majesty reaches his seventy-seventh birthday on Sunday, December, 5, 2004 and, as the Thai people celebrate the anniversary of the birth of the world’s longest-reigning monarch, the Chiangmai Mail presents this supplement, prepared by special correspondent Peter Cummins, as a “Happy Birthday” tribute to our beloved King. There will inevitably be some familiar material in parts in this story, for the King’s development projects have been ongoing for more than 50 years and there is, of course, a historical perspective which has been encapsulated. Thirty-seven years ago, on December 16, 1967, world sporting history was established down in Pattaya and it was an occasion that probably will never be equalled. At the National Stadium in Bangkok on that day, His Majesty the King and his eldest daughter, Princess Ubolratana mounted the winners’ podium to receive a gold medal from Her Majesty Queen Sirikit. It was the Awards Ceremony of the Fourth South East Asia Peninsular Games (now known as the South East Asian (SEA) Games). King Bhumibol, racing OK dinghy number 27, and Princess Ubolratana, sailing OK 18, finished equal first in the OK Dinghy Division of those games. It was only in the last race where the Princess, trailing father, with the late Dr Rachot Kanjanavanit in the lead, made some quick manoeuvres on the last beat to the finishing line. Although the petite Princess was over-whelmed by the strong north-easterly prevailing in Pattaya Bay, she used guile and wits, far in excess of her tender years and, by tacking on wind-shifts, the Princess crossed the fleet to finish first and equal on points with the King, who still trailed Rachot, in third place. When a father and daughter finish equal first in an international yachting competition, it is history. But, when the equal winners are a King and his daughter, a Princess, it is immortal. That day, December 16, thirty-seven years ago, has now been enshrined as Thailand’s National Sports Day, in honour of the occasion. It was actually M.C. Bhisadej Rajani who introduced the King to sailing - perhaps by default. In early 1963, the King was rowing off the Klai Kangwol Palace, when he passed Prince Bhisadej sailing along - very slowly. Upon arriving back at the beach, the King examined M.C. Bhisadej’s boat and thought there must be a way of sailing faster. That started the interest and together they built a number of boats in a room at the Chitralada Palace in Bangkok, using the palace ‘moat’ to test some of the dinghies. The King and Prince Bhisadej built and sailed the King’s Enterprise, “Rajpatan” and, later, in April 1966, in the single-handed OK dinghies they had also built, they sailed across the Gulf from Klai Kangwol to Toey Harbour, Sattahip. This gruelling crossing - recognized at the time as the longest open-dinghy voyage out of sight of land - has been commemorated each year as the “Vega Rudder” race, so named after the King presented the dinghy’s rudder as a perpetual trophy. During the 1960s, the Royal Family often went to sail at the newly-formed Varuna Marine Club at South Pattaya and many there, including such visiting Royalty as UK’s Prince Philip and the then Danish Princess - now Queen Margrethe II - enjoyed the hospitality and camaraderie of the Thai Royal Family. In recognition of the King’s prowess as a dinghy sailor - and his great contributions to sport, particularly - at the time of his fifth cycle, 60th birthday in 1987, the International Olympic Committee bestowed the Olympic Order Gold upon the King, the only reigning Monarch to receive such an honour. In his Coronation Oath, promulgated on the fifth of May 1950, the newly-crowned Rama the Ninth vowed that “We will reign with righteousness for the benefit and happiness of the Siamese people” and during the almost-55 years which have passed since that auspicious day, the concept of “righteousness” has dominated his reign. In fact, the King has, throughout his rule, constantly revered the age-old Buddhist concept of ‘Kingship’ as defined in the “Sutta Pitaka” of the “Tripitaka” in which a King is defined as “Mahasammata” - a King of Righteousness. The Buddhist scriptures also define the genesis of the universe and the progression of evils which befall mankind: greed, stealing and lying and the inevitable repercussions of censure and punishment. Our King has steadfastly reigned by these principles, embodying good kingship in his own life and often speaking out against the affliction of the evils so clearly spelled out in the Buddhist philosophy - evils and afflictions which seem to have become progressively worse in the past year. It was in 1969 when the King, greatly concerned about the cultivation of and addiction to opium among the hilltribes, initiated the Royal Development Project, establishing it with his own personal funds. Not only was the poppy cultivation a destructive force but the slash-and-burn farming practiced by the hilltribes was destroying vast areas of forest and devastating the watersheds of the northern areas. 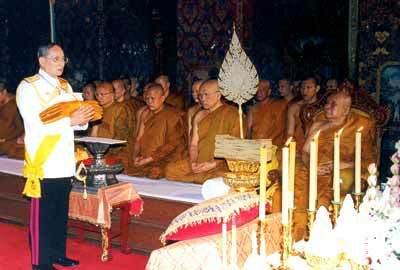 18 October 2003 His Majesty the King presents the Annual Kathin Robes to the congregation of monks at Wat Bavornives, Bangkok. The King then established the Royal Project Foundation, appointing Prince Bhisadej Rajani, life-long friend, advisor and confidante, as director and, in the more than three decades of Bhisadej’s dynamic leadership, the Royal Projects have incorporated five development centres around the Kingdom. A typical example of the King’s ongoing concern for the people and the environment in which they live, was a field trip he undertook in 2001 to Prachuap Khiri Khan Province to visit the Royal Rainmaking Research and Development Institute. But he did not go alone; rather, he took a group of students from the Klai Kangwol School with him to inspect the project. The King patiently explained the mechanisms and complexities of the system to the students. “Such a project as this helps alleviate drought and water shortages - often critical in such dry provinces as Prachuab Khiri Khan and many other rural areas,” the King pointed out to the youngsters. His Majesty’s ‘outing’ with these school children again underlined his concern about the efficacy of his numerous development projects in reaching out to even the least of his subjects. The King established five other Royal Development Study Centres - or, as they are better known - “Living Museums” - situated in the roughest terrain in their respective regions. These centres are the locale for experiments in re-forestation, irrigation, land development and farm technology which are conducted to find practical applications within the constraints of local conditions, geography and topography. His Majesty’s aim in all these centres is to restore the natural balance to enable people to become self-supporting. The first centre organized was that of Khao Hin Son in the rocky area of Chachoengsao’s Phanom Sarakam District. Here, the centre studies how to turn the barren soil, caused by de-forestation, back into fertile land again. Other centres are located at strategic places around the Kingdom. The Pikul Thong Centre at Narathiwat studies the swampy, acidic land of the southern-most region. The Phu Phan Centre in Sakhon Nakhon studies soil salinization and irrigation in the country’s biggest region, the Northeast which suffers from endemic drought. The Krung Kraben Bay Centre in Chantaburi examines the rehabilitation of mangrove forests and coastal areas following massive destruction. The Huay Sai Centre in Petchaburi studies the rehabilitation of degraded forests and shows villagers, in their turn, how to protect the forests. Perhaps applying the “self-sufficiency” philosophy to his own approach, the King would fly over a particular area, armed with aerial photographs and maps of the terrain, noting features as they passed beneath the plane. Being a capable photographer himself, he would shoot his own pictures and later superimpose them over the charts to obtain a detailed image of the area of his concern. This greatly helped in his planning of specific development projects. Throughout the more than five decades that the King has ruled Thailand, not only Thais, but people around the world have become accustomed to seeing His Majesty travelling to remote areas of the country. He works with - and brings rational development to - even the poorest and most disadvantage groups. He has often been filmed leading officials, farmers and many diverse groups up rough mountain trails, over bridges, punting along in small sampans, to initiate sustainable projects and ideas, aimed at helping the many who have been forgotten or left behind in the development process. His Majesty’s insightful approach to local prevailing conditions has enabled him to improvise new theories for agricultural development, to provide guidelines for educating farmers on self-sufficiency, and to solve problems of goitre by feeing iodine into salt roads at strategic points. In all these initiatives, His Majesty has promoted a simple approach using environmentally-friendly techniques and utilizing moderate amounts of locally available resources. For example, before environmentalism became a major force in the development equation, His Majesty was using vetiver grass to prevent erosion, controlling ground water levels to reduce soil acidity, and seeding clouds with simple materials such as dry ice, to produce rain. His Majesty works on a nation-wide basis, not just in rural Thailand, but all over the Kingdom. Among his most significant contributions have been bringing different people and agencies together to work more cooperatively than previously on urban problems. He has coordinated activities between different interest groups and agencies in Bangkok to deal with water purity and flood control in simple, natural ways. The King’s lifetime dedication to natural development as a means of improving the lives of his people inspired the Royal Development Projects Board to make better known the vast range of the Royal Projects, especially to the more marginalized echelons of society who are the ultimate beneficiaries of the King’s wisdom. Ultimately, the Department of Technical and Economic Cooperation and the United Nations Development Programme (UNDP) joined forces to help further the Royal initiatives. For some 50 years, these two organizations have focused attention on His Majesty’s devotion to sustainable social progress, better standards of living, as well as unity in development and the quest for peace and security. The UNDP, particularly, as the world’s largest source of technical assistance aid, has been actively supporting many of the King’s initiatives, benefiting from his example and joining his efforts to improve human capacity, sustain livelihoods and, especially, to help regenerate the environment. Nevertheless, the King’s philosophy to development problems has been to “keep it simple” - relying on an intimate knowledge of nature and her immutable law, such as using fresh water to flush out polluted water or dilute it through utilization of normal tidal fluctuations. The ubiquitous water hyacinth, too, can be ‘harnessed’ to absorb pollutants. His Majesty compares this to using “adharma” (evil) to fight evil, observing that both pollution and the water weed are a menace, but they can be used to counteract each other, thus lessening the damage to the environment. The King himself practices this “simple approach” and brings a down-to-earth approach to which the people can readily relate. He studies and deliberates exhaustively on the particular project and then reveals his thinking in short, easy-to-grasp titles. The very simplicity belies the profundity of the philosophy, for each title reflects a much deeper insight into a given problem and often, at the same time, hints at the mode of operation to be employed. The Royal Development Projects Board, under the Office of the Prime Minister, also serves as the secretariat for the Chai Pattana Foundation which is directly responsible for the work related to the Royal Projects. Now, more than three decades later, the results can be seen in the new life which has come to many of the mountain villages. Greenery has returned to once-denuded forest areas and barren hills and the opium cultivation, a cause of extreme national concern, is virtually a past era. “The key to the success of the Project lies in His Majesty’s guidelines,” explains Royal Projects Director HSH Prince Bhisadej Rajani. “They focus on obtaining knowledge, through research, avoiding bureaucratic entanglements and swift action to respond to the villagers’ needs, while promoting self-reliance,” he adds. The effectiveness of this approach has been applauded internationally. For example, in 1998 the Royal Projects won both the “Magsaysay Award for International Understanding” and the “Thai Expo Award” for attaining the highest quality standards of Thai Goods for Export. 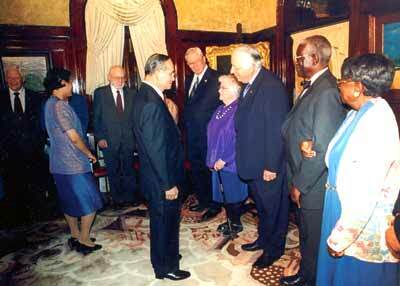 The King’s own views are that development must respect different regions’ geography and peoples’ way of life. “We cannot impose our ideas on the people - only suggest. We must meet them, ascertain their needs and then propose what can be done to meet their expectations,” the King pointed out recently. Inaugurated seventeen years ago to honour His Majesty the King on the occasion of his sixtieth birthday, the Phuket King’s Cup Regatta, which has been held every year since then, with this year’s 18th regatta, celebrating - and opening on Sunday, 05 December, the day of the Monarch’s 77th birthday. 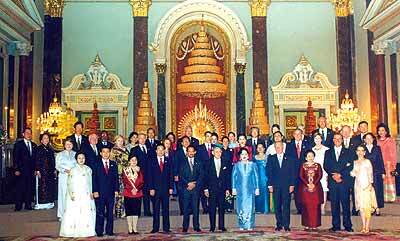 20 October 2003 Their Majesties the King and Queen receive the APEC leaders who came to attend the 11th APEC Economic Leader’s Meeting hosted by Thailand, in audience, at the Chakri Throne Hall, the Grand Palace. His own example has always been a great source of inspiration to athletes everywhere and his Gold Medal award as a dinghy sailor 37 years ago is equalled by a land-based record, being the only person to have lit the torch opening the Asian Games on four occasions, the last being in Bangkok in 1998. In recognition of the King’s prowess as a dinghy sailor - and his great contributions to sport, particularly - at the time of his fifth cycle, 60th birthday in 1987, the International Olympic Committee bestowed the ‘Insignia of the Olympic Order’ upon the King, the only reigning Monarch to receive such and honour. “The Olympic award was made not only to recognize the King’s prowess as a dinghy sailor,” said ACM Dawee, “but also to acknowledge the leading role he has played in promoting all sports - in Thailand, in the region and internationally - always displaying a firm grasp on the history and the finer points of a multitude of sports,” Dawee added. The King’s musical talents - from scores and compositions ranging from jazz to classical - are well known. In fact, earlier this year, at a concert given by the magnificent Vienna Philharmonic Orchestra, in honour of Her Majesty’s 72nd, Sixth Cycle birthday, the orchestra paid tribute to His Majesty’s musical abilities, playing highlights during the concert intermission, from the King’s own composition “Kam Warn” (Sweet Words), arranged by Thai conductor and musician “par extraordinaire”, Rear Admiral Usni Pramoj. His Majesty’s formative musical life was influenced by the culture and history of Europe. His predilection towards jazz saw him excel there too, playing with some of the best contemporary jazz bands. It is apt to record here that during Their Majesties’ state visit to Austria in 1946, a number of the King’s compositions were aired at the Concert Hall of Vienna’s Msikverein, home of the Vienna Philharmonic. Two days later, on the fifth of October, 1946, His Majesty was installed as an Honorary Member of “Die Akademie fur Musik und Darstellende Kunst in Wien” (the Vienna Academy of Music and Dramatic Arts) - indeed a rare honour for His Majesty and Thailand. Last year, the King was awarded a Doctorate in Music by the University of North Texas, to acknowledge his competence with several instruments, including piano, saxophone, clarinet, guitar and violin and his compositions in English and French. Earlier this year, the University’s 25-member “One O’clock Jazz Band” came to Thailand to perform before His Majesty. 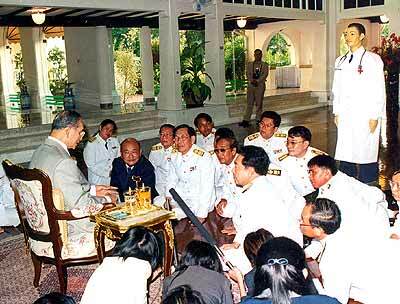 6 June 2003 His Majesty the King grants an audience at Klai Kangwol Palace, Prachuap Khiri Khan Province, to members of the Development and Construction Committee of the Royally Sponsored Robot Doctor and party, who came to demonstrate the Robot Doctor to His Majesty and to receive royal advice as guidelines for future construction. The King, greatly disturbed by the violence in the South, furthermore, has been troubled by the corruption which he pointed out would “surely destroy the country”, the governance of which should be based on “the five Buddhist Precepts”. The King counselled Thais to unite, seek peace and to lead a modest life and be satisfied with what they have, as a way to prevent corruption, surmising that “the wealthier a person becomes, the more corrupted one becomes.” The King gave an example of the high-scale corruption emanating from this concept, citing the greed of employees of such companies as Enron and WorldCom in the United States. Long Live the King! Happy Birthday, Your Majesty.